Today we will take a look at the beaches in the coastal resort of Torrevieja, Costa Blanca South, Spain. This city remains a top holiday spot throughout the year for thousands of international visitors who enjoy an average of 320 days of sunshine a year. Torrevieja has over 20 km white sandy beaches and coves to choose from. Here are the most popular ones. Playa del Cura. 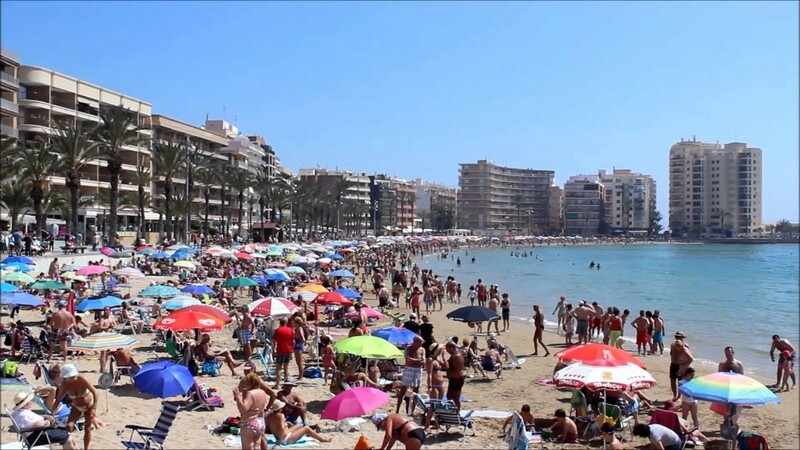 This is Torrevieja's most urban beach and probably the top favourite for most holidaymakers. It is a great beach for a family day as its promenade is lined with bars, shops and restaurants. Playa de Los Locos. This is a large sandy beach just up the coast from Playa del Cura. If you like a quiet swim we recommend early mornings or evenings. It is another popular spot to enjoy a day in the sun with the whole family. Playa de Los Náufragos. This is a very central beach with easy access from the centre of Torrevieja where you can enjoy a large number of sports activities. Los Náufragos receives around 8,000 visitors per day in the summer months. Playa del Acequión is located next to Los Náufragos and is the perfect place for kids as the water is always calm and shallow thanks to the safety perimeter of the Marina. La Mata is the largest beach in Torrevieja and is a great spot for families and water sports enthusiasts. Located up north, this fabulous beach has a length of over 2,500 metres. La Mata beach holds several beach volleyball courts and even a beach football pitch. The perfect place to make the most of the sun!